In early 2015, the Tax Foundation released a paper that examined a business tax reform plan developed by Representative Devin Nunes (R-CA). Using the Tax Foundation’s Taxes and Growth (TAG) Model, we estimated the growth and revenue effects if the plan were enacted. Since then, Rep. Nunes has refined his proposal. The thrust of the plan remains the same as before – reduce tax biases that discourage business activity and simplify the tax treatment of businesses – but some of the provisions have been clarified or modified. This paper is an update of the earlier one in two senses. It models Rep. Nunes' revised plan. It also employs a newer version of the Taxes and Growth Model. The results here supersede the earlier ones. Eliminating the individual and corporate alternative minimum taxes (AMTs). We used the Taxes and Growth Model (TAG) to evaluate the economic and budget implications of the Nunes plan. We did not model the proposal’s international and transition provisions. We also did not estimate the economic benefits of simplifying the tax system, although several provisions in the legislative proposal, such as full expensing and cash-flow accounting, would be major steps in that direction. The Taxes and Growth Model estimates that the economy would by 7.3 percent larger after approximately a decade if the Nunes plan were enacted. The plan would increase the level of investment by 22.1 percent, lift wages by 6.0 percent, and create 1.4 million full-time-equivalent jobs. If its pro-growth effects are disregarded, the Nunes proposal would appear costly for the federal treasury. The model reports a static (no growth) 10-year revenue score of -$1.6 trillion. However, the model predicts that, on a dynamic basis, the plan would increase federal revenue by $631 billion over 10 years and by $288 billion in the 10th year. The two main drivers of economic growth in the plan are the full expensing of capital investment and the lower tax rate on business income, both of which significantly reduce the tax code’s bias against saving and investment. Representative Devin Nunes (R-CA), an eleven-year veteran of the House Ways and Means Committee, has spent several years crafting a plan to reform the way the federal government taxes business income. Rep. Nunes is convinced the current rules unnecessarily damage the U.S. economy, and he hopes to achieve a better tax system that would lead to increased productivity, more jobs, higher incomes, and improved opportunities for people across the income spectrum. We estimated the economic and revenue effects of the Nunes draft proposal using the Tax Foundation's Taxes and Growth Model. The simulation results indicate that the plan would significantly lower tax biases against saving, investment, and entrepreneurship. Because the plan would greatly reduce tax penalties on productive business activities, we find it would be strongly pro-growth. We estimate the growth dividend would be sufficiently strong that the plan would increase federal revenue in the long term, although tax receipts would drop for the first several years as the economic gains were building up. The model predicts that the plan, if enacted, would ultimately lift the level of GDP 7.3 percent ($1.3 trillion annually in 2015 dollars), increase the capital stock (equipment, structures, intellectual property, etc.) by 22.1 percent, advance the real wage rate by 6.0 percent, and raise hours of employment by 1.5 percent (the equivalent of over 1.4 million added jobs). The main reason for the growth is that the plan would significantly reduce tax biases against saving and investment. In a conventional revenue estimate, which assumes tax changes do not alter the economy’s total size or growth, the model estimates that the plan would reduce federal revenue by $1.6 trillion over the 10-year period 2015-2024. However, in a dynamic revenue estimate, which considers tax-induced growth effects, the model foresees revenue turning positive by 2020, leading to a cumulative revenue gain over the 10 years of $0.6 trillion. If growth is ignored, the plan appears mainly to benefit the top 10 percent of taxpayers. When economic growth is factored in, however, the model estimates that the Nunes proposal would raise the after-tax incomes of taxpayers at all income levels by over 6 percent. Although Rep. Nunes has stated that many parts of the income tax code are deeply flawed, he decided to focus on business taxes because he feels it will be easier to pass tax reform by taking a step-by-step approach, starting with an area of the tax code that is widely acknowledged to need repair. Additionally, Rep. Nunes thinks that improving the tax treatment of business income will yield a large bang for the buck in terms of a stronger, faster-growing U.S. economy. In that respect, he may be taking a page from the playbook of the John F. Kennedy Administration, which in seeking to revitalize the economy through tax relief, began with business taxes and then moved to individual taxes. The American Business Competitiveness Act of 2014 addresses several concerns regarding how the federal government currently taxes business income. The income tax discourages investment because it requires businesses to write off many of their capital expenditures over multi-year periods – from 3 years to over a decade for much equipment and several decades for many structures – rather than letting the businesses deduct investment costs when they occur. Because of the time value of money, the present value of a stretched out deduction schedule falls short of the actual cost of the investment. A further problem is that multi-year write-offs are inherently complex, especially because an investment’s write-off schedule often varies depending on the type of asset and on the industry in which it is used. Special rules designed to soften the anti-investment bias engender further complexity. The United States has the highest corporate income tax rate of any developed nation. That reduces the ability of U.S. companies to compete domestically and internationally. The combined state and local corporate income tax rate in the United States is 39.1 percent. The other industrialized nations in the Organization for Economic Cooperation and Development (OECD) have an average corporate rate of 25 percent (29 percent if weighted by GDP). From 1990 to 2014, the average combined corporate tax rate in other OECD nations fell by 16.2 percentage points, from 41.2 percent to 25 percent. The U.S.’s combined corporate tax rate actually rose slightly due to a 1 percentage point increase in the federal rate. The United States is one of the few nations that taxes its businesses on the income they earn in foreign nations as well as at home (worldwide taxation). Most countries tax businesses on domestic income but not income from foreign operations; they leave that to the countries where the income occurs (territorial taxation). Worldwide taxation diminishes the international competitiveness of U.S. companies, gives U.S. companies a tax incentive to reorganize abroad, and has the unintended effect of helping foreign companies acquire U.S. companies. The U.S. tax system penalizes companies when they use equity financing instead of debt financing because companies can deduct interest costs as a business expense but they cannot deduct dividend payments. Because of this tax bias, companies rely too little on equity and too much on debt, which reduces their financial flexibility and increases risk. The Nunes plan seeks to correct the above shortcomings of the current tax code through a number of reforms to the business tax system. Its main provisions will now be sketched. The plan would let businesses claim the full costs of equipment, structures, intellectual property, inventories, and land in the same year they purchase the assets, with immediate deduction of the entire outlay, creating a “cash flow” tax that fully accounts for all the costs of business investment. For example, while current law most commonly requires businesses to write off the cost of an equipment purchase over five or seven years, the Nunes plan would permit the business to recognize the whole cost on its tax return when it incurs the cost. (Section 179 for small businesses and bonus depreciation are two limited forms of expensing, but the Nunes plan would generalize this treatment.) Unused deductions could be carried back up to five years or carried forward with interest. In addition to more accurately measuring business expenses and net income, expensing is much simpler in terms of recordkeeping and computations than the stretched-out write-offs of depreciation, amortization, and capitalization. This provision would bring the United States into conformity with most other nations. The Nunes plan would not let nonfinancial businesses deduct interest payments, but would not tax them on interest receipts. It would generally not allow individuals to deduct interest payments, except that home mortgage interest would remain deductible, and it would apply the same tax-rate limitation to individuals’ interest income as to dividends (top rate of 20 percent). These changes would have a mixed effect on tax biases. On the one hand, they would lessen the tax distortion at the corporate level between debt and equity financing. Because debt is riskier than equity (debt payments are legally required regardless of business cash flow), corporate businesses would be better able to weather economic adversity if the tax system did not push them so strongly toward debt financing. On the other hand, the changes would mean that corporate returns financed through debt would be taxed at both the corporate and individual levels, as is now the case with corporate equity. A better solution would be corporate integration, so that corporate returns would be taxed once, either at the corporate or individual level. Numerous tax “breaks” today are designed to partially offset the anti-investment bias of delayed write-offs on capital expenses. They would no longer be needed with expensing, and the Nunes plan would end them. For example, the plan would repeal the domestic production activities deduction. The deduction is intended to bolster domestic manufacturing, which is disproportionately impaired by long depreciation lives. The plan’s combination of expensing and lower tax rates would exert a far bigger impact on after-tax rewards and be a more powerful spur to manufacturing, rendering the deduction unnecessary. The plan would also remove some items, such as various alternative energy credits, that are essentially subsidies which might better be delivered through spending programs rather than the tax code, if they are provided at all. The plan has a number of transition rules designed to protect taxpayers during the changeover. For instance, taxpayers could continue to claim write-offs for old assets that had not yet been fully depreciated under old law. The plan also contains one transition provision included for revenue reasons: a 5 percent “toll charge” on unrepatriated foreign earnings. Although that would be an unexpected tax hit, the rate is low enough that most U.S. companies with foreign operations accept it with little protest in exchange for territorial taxation. The Taxes and Growth Model combines a detailed individual income tax calculator with a model of production in the U.S. economy. The tax calculator is calibrated to data from a large, anonymous sample of individual tax returns (the IRS’s 2008 Public Use File). The economic model is scaled to data from the National Income and Product Accounts. The Taxes and Growth Model estimates the change in tax liabilities under the new tax rules and examines whether the new rules would alter the after-tax rewards for work, saving, and investment at the margin. If the tax changes improve incentives, people will supply more labor and capital in production, which leads to more output and a stronger economy. Conversely, worse after-tax incentives result in a weaker economy. Both labor and capital respond to incentives, but capital (equipment, structures, intellectual property, etc.) is especially sensitive. In addition to estimating the long-run changes in employment, wages, the capital stock, and production, the Taxes and Growth Model takes account of the feedback effect of changes in GDP and income on tax collections. That provides a dynamic revenue estimate. The model also generates a conventional revenue estimate, which is based on the simplifying but unrealistic assumption that tax changes never affect total investment, employment, production, national income, and other measures of overall economic activity. The static and dynamic revenue estimates are both benchmarked against the 10-year baseline that the Congressional Budget Office (CBO) issued in August 2015. Imposing a 5 percent "toll charge" on unrepatriated foreign earnings. Because of limitations in tax data and the model, we did not model the transition provisions, the expensing of inventories and land, the interest switch in the case of pass-through businesses, the plan’s provisions for financial businesses, the shift to territorial taxation, the administrative costs of adjusting to the new tax rules, or the administrative savings later from a simpler tax system. Our core finding is that the business tax reforms proposed by Rep. Nunes would benefit workers, business people, and the overall economy. It would generate several years of rapid growth, boosting output, income, and employment to higher levels than the economy would achieve under current law. 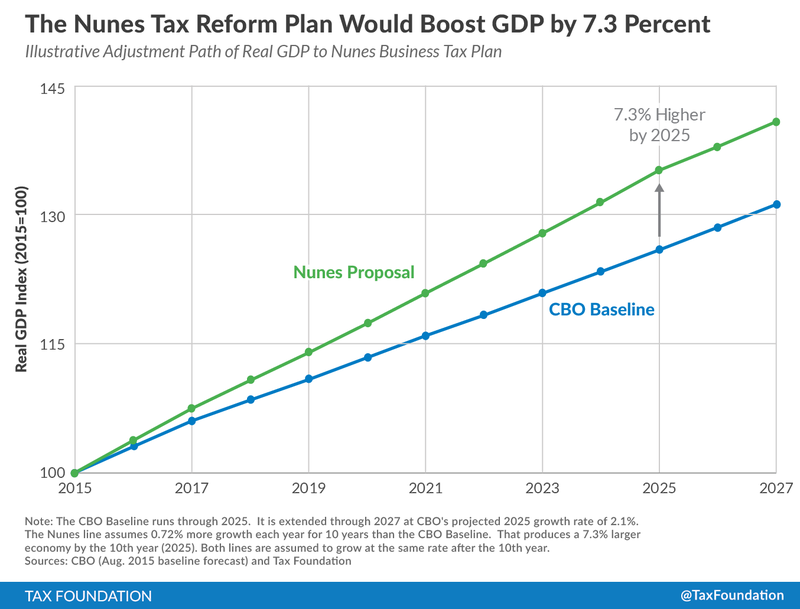 As shown in Table 1, the Taxes and Growth Model estimates that the Nunes plan would ultimately lift GDP 7.3 percent ($1,290 billion annually in 2015 dollars), increase the stock of private business capital by 22.1 percent, advance the real wage rate by 6.0 percent, and raise hours of employment by 1.5 percent (the equivalent of 1.4 million added jobs). The model also estimates that the plan would reduce federal revenue by $1.6 trillion over a decade according to a conventional revenue score which makes the static assumption that taxes never affect the overall economy’s size or growth rate. In a dynamic revenue estimate that takes account of the larger economy, the Taxes and Growth Model calculates that federal revenue would turn positive after about 5 years and that the plan would increase federal revenue by $0.6 trillion over the 10-year period. The explanation for the reversal is that, other things equal, the government collects more revenue when the economy is large and healthy than when it is smaller and weaker. The feedback is rarely strong enough for a tax cut to be self-financing, but the Nunes plan would be an exception because of the robust growth effects from expensing and from the lower corporate income tax rate. The estimated GDP gain over the 10 year period 2015-2024 would be $9.3 trillion. The gains would not come to fruition instantly. The model is long run, and the economy would need several years to respond fully to the lessened tax biases against work and investment. Capital usually requires more time to adjust than labor, but based on rates of capital replacement, most of the added equipment would be put in place within five years and most of the added structures within 10 years. Chart 1 offers an illustrative adjustment path for GDP. The baseline is the CBO’s August 2015 projection of real GDP growth over the next decade (with 2015 set at 100). The higher line represents the Nunes proposal. It is drawn under the illustrative assumption that it would lift GDP growth by an extra 0.72 percent each year during the next decade. At the end of the tenth year, GDP would be 7.3 percent above the CBO baseline. Thereafter, the growth spurt would level off, and the two growth lines would move in parallel, with GDP under the Nunes business tax reform continuing to be 7.3 percent higher than under current law. The most obvious reason why the Nunes plan would spur growth is it would significantly cut business tax rates, thereby easing tax biases that hold back investment, work effort, and production. The Taxes and Growth Model estimates, for example, that a 25 percent corporate income tax rate, with no other changes in the tax system, would lead to a 6.7 percent bigger capital stock, 425,000 additional jobs, and a level of GDP 2.3 percent higher than would be achieved at the current 35 percent rate. *This models full expensing of equipment, residential structures, and nonresidential structures. It does not model expensing of inventories and land. Just as a conventional revenue estimate does not mirror reality when a tax change would have substantial positive or negative growth effects, so too a conventional distributional analysis may be misleading when growth effects are significant. As shown in the static column in Table 3, a standard distribution table, which ignores growth effects, would suggest that the Nunes plan would do little for the poor and middle class, and mainly help the well-off. According to the table’s static column, the average gain in after-tax income would be 0.2 percent for taxpayers in the 10-20 percent decile, 0.3 percent for the 50-60 percent decile, and 4.3 percent for taxpayers in the top 1 percent. Source: Tax Foundation, Taxes and Growth Model (October 2015 version). However, the dynamic column illuminates the benefits of faster economic growth. All income groups would gain as the economy expands. Although the distribution of benefits would not be exactly equal, the gains would significantly help people throughout the income spectrum. For example, the after-tax income increases would be 7.0 percent on average, 6.4 percent for the 10-20 percent decile,7.4 percent for the 50-60 percent decile, and 8.5 percent for the top 1 percent. The federal government has not overhauled how it taxes business income since the Tax Reform Act of 1986. That was a generation ago. In the intervening years, most other developed countries have lowered their corporate rates and moved toward territorial taxation. As other countries modernize, it has become increasingly obvious that business taxation in this country is out of date, a drag on competitiveness, and in need of reform. The Tax Foundation’s Taxes and Growth Model was used to evaluate the long-term effects of a business-tax-reform plan developed by Rep. Devon Nunes. The plan, once fully implemented, would produce a more efficient tax system with fewer biases against business activity. The result would be significantly faster growth. The Nunes plan would create conditions leading to more jobs, higher incomes, and better opportunities for people across the income spectrum. Michael Schuyler, “The Growth Effects of the Nunes Plan to Reform Business Taxation” Tax Foundation, February 26, 2015, https://taxfoundation.org/article/growth-effects-nunes-plan-reform-business-taxation. For a two-page summary, see Rep. Devin Nunes, "The American Business Competitiveness Act (ABC Act), Section-By-Section Summary," http://nunes.house.gov/uploadedfiles/abc_section-by-section_summary.pdf. For a presentation of Rep. Nunes’ longtime goals in his own words, see Devin Nunes, "A Tax Reform to Get Businesses Expanding," The Washington Post, (Oct. 11, 2012), http://www.washingtonpost.com/opinions/a-tax-reform-to-get-businesses-expanding/2012/10/11/2d536956-0f4a-11e2-bd1a-b868e65d57eb_story.html. An early version of the Tax Foundation model found that both the Kennedy Administration's business tax relief of 1962 and the individual rate cuts, which passed Congress early in the Johnson Administration, helped the economy, but that the business tax cuts generated more of the growth. 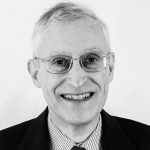 See Stephen J. Entin, "Economic Consequences Of The Tax Policies of the Kennedy and Johnson Administrations," Institute for Research on the Economics of Taxation, IRET Policy Bulletin No. 99, September 6, 2011, http://iret.org/pub/BLTN-99.PDF. Kyle Pomerleau, "Corporate Income Tax Rates around the World, 2015," Tax Foundation Fiscal Fact No. 483, October 1, 2015, https://taxfoundation.org/article/corporate-income-tax-rates-around-world-2015. These numbers refer to statutory tax rates. The United States also has one of the highest effective corporate tax rates. See Jack Mintz and Duanjie Chen, "U.S. Corporate Taxation: Prime for Reform," Tax Foundation Special Report No. 228, February 4, 2015, https://taxfoundation.org/article/us-corporate-taxation-prime-reform. Pomerleau, op. cit. ; and Tax Foundation, "OECD Corporate Income Tax Rates, 1981-2013," Tax Foundation, December 18, 2013, https://taxfoundation.org/article/oecd-corporate-income-tax-rates-1981-2013. Philip Dittmer, "A Global Perspective on Territorial Taxation," Tax Foundation Special Report No. 202 August 10, 2012, https://taxfoundation.org/article/global-perspective-territorial-taxation. On the last point, if a U.S. company with some foreign operations sells itself to a company based in a nation with a territorial tax system, the foreign operations will no longer be subject to U.S. tax. (The foreign operations will still be taxed in the country where they occur.) Because of this tax difference, the company’s after-tax value to the acquiring firm may be greater than its after-tax value if it remained an independent American company. For the same reason, the U.S. territorial tax system, coupled with the high U.S. corporate tax rate, is the primary force driving corporate inversions, in which a larger U.S. business merges with a smaller foreign business and they then set up their legal domicile abroad. In response to a Tax Foundation question, Rep. Nunes' office stated that their intent is for pass-through businesses to continue paying a single layer of federal income tax as they do now, but with the top statutory rate capped at 25 percent instead of current law's 39.6 percent. Because the income of C corporations is taxed at the corporate level and again at the individual level (when distributed through dividends or realized as capital gains), the cumulative income tax rate for C corporations would still be higher than for other businesses. If the tax rate on business income is 25 percent and the tax rate on capital gains and dividends is 20 percent, corporate income would face a combined tax rate of 40 percent compared to 25 percent for noncorporate business income. For a fuller discussion of the model, see Michael Schuyler, “The Taxes and Growth Model—A Brief Overview,” Tax Foundation Fiscal Fact No. 429, May 6, 2014, https://taxfoundation.org/article/taxes-and-growth-model-brief-overview. There are some gains for the poor and middle class even in the static analysis. That is because many people who are not wealthy (such as many retirees) do own some stock, often through mutual funds. They would benefit from the lower corporate tax rate because much of the tax savings would pass to them in the forms of higher dividends and capital gains.